Speakers from Nanosys gave several presentations, conducted a quantum dot workshop and had a booth on the tradeshow floor. They were clearly the most visible and pro-active quantum dot maker at SID this year. Russell Kempt, VP of WW Sales and Marketing gave a presentation at the Business Conference ( YouTube video of presentation). It was titled: Quantum Dots: The Technology Platform for All Displays. This pretty much summed up the company’s message at SID. The presentation was all about presenting their roadmap for QD materials development to support various applications. Today, that means QD films (QDEF) manufactured by its partners (available in Cd-based, Cd-free and Low-Cd). They have made progress in their QD materials allowing a relaxation on the barrier film requirement from 10-3 to 10-1. This has meant a cost reduction, which they say is proceeding at a 30% cost down per year rate. One of the important take-aways for Nanosys was the many questions people asked about Cd-based and Cd-free quantum dots. 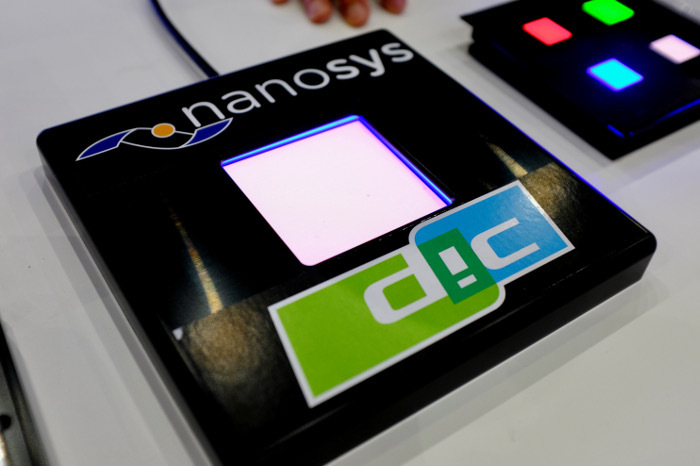 Nanosys actually makes three flavors of quantum dots: Cd-based, Cd-free (InP) and Low-Cd (their Hyperion product that uses red Cd-free and green Cd-based). “Everything beyond the QDEF technology is 100% heavy metal, 100% cadmium free. We don’t develop any cadmium-base products going forward. We don’t need to. 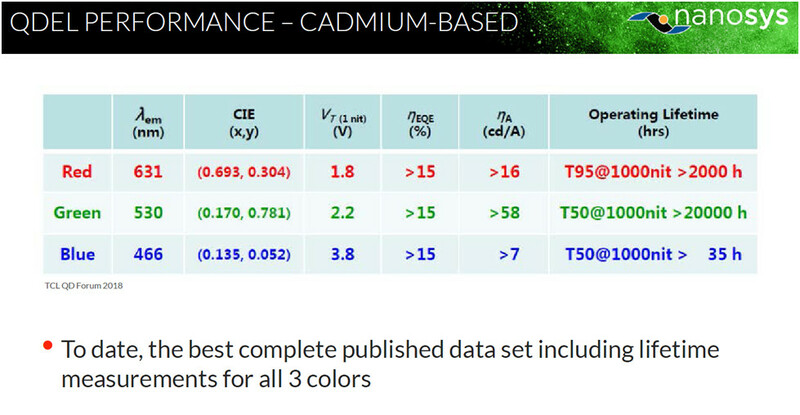 We’ve made enough improvements in the cadmium-free products to not have to go back and work with cadmium,” noted Kempt (quote from the 13 minute, 30 second mark of presentation). Next on their roadmap is QD on Glass (QDOG), which was being shown on the trade show floor by Samsung Display. The glass comes from Corning and is only 2mm thick, with the final TV only 5mm thick. Having a glass lightguide plate compared to a plastic one allows a big thickness reduction. The QD film is laminated to this glass lightguide plate with a cover glass sheet so no barrier films are needed – glass is a great barrier material. Samsung was showing a 65″ 8K TV with a direct backlight along with a 31.5″ 4K monitor. The third stop is QD color conversion. This category includes conversion in the color filter along with architectures that feature a blue OLED backplane or a blue microLED backplane. The color filter solution has the benefits of wide viewing angle and very big increases in efficiency, but it requires the development of an in-cell polarizer, which is very difficult (AUO showed a mirror display with an in-cell polarizer at SID). Both photolithographic and ink jet printed approaches are being developed by Nanosys and partners. Ink jet printed samples are currently available from DIC with production slated for 2020. Current results look impressive (blue diffusion needs improvement) and are shown below. For the microLED or OLED backplane approach, a lithographic approach may be needed to get to smaller pixel pitches. 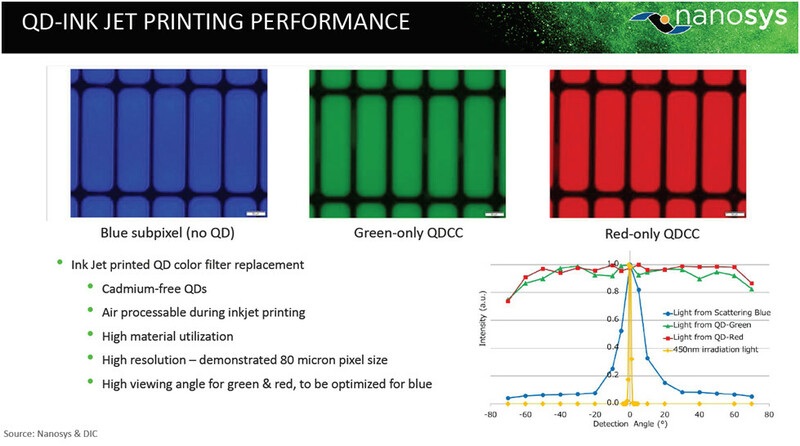 Three and four micron demos of red and green QD emitters have been shown. The final stop on the roadmap is electroluminescent QDs where current excites red, green or blue emission. This is clearly several years off but would have OLED-like performance and features. Current performance of their materials is shown below, which are all based on Cd-free materials. This may actually be the only published data on Cd-free EL QD material properties. Lifetimes remain a critical issue with blue being the most challenging. 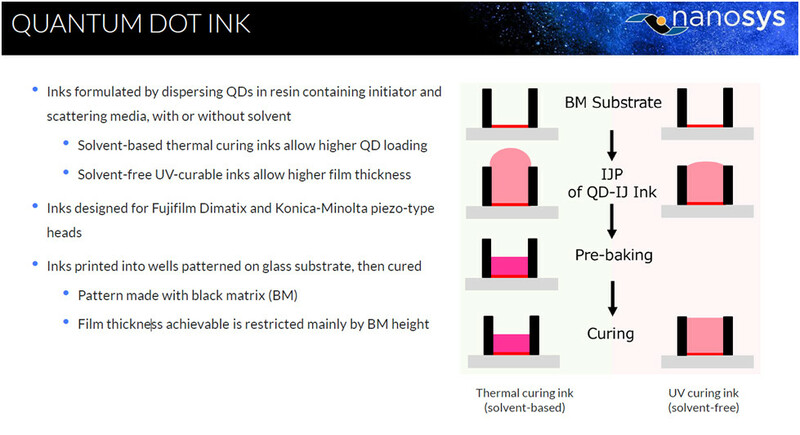 Ernie Lee, a Senior Engineer at Nanosys, gave a talk titled “Quantum Dot Conversion Layers Through Inkjet Printing.” Nanosys is working with DIC, a fine chemicals company with a leading market share position in printing inks and pigments. Details of the two types on ink and the basic structures and manufacturing flow are well detailed in the chart below. Which approach to use depends upon the application. This 90-minute short course was taught by Charlie Hotz (video of full short course). 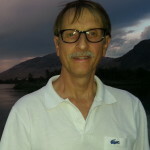 The course provided an overview of Nanosys and their history of QD development, plus basics on QD chemistry, fabrication methods and properties. Hotz then talked about color, HDR and the value proposition for QDs in displays. 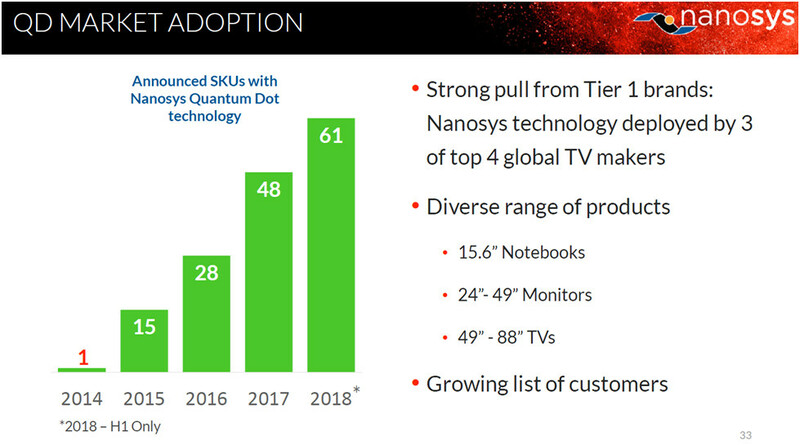 Market adoption for Nanosys-based products has been quite strong with 61 SKUs in the market so far in 2018. He then dug more deeply into the various QD architectures detailed in the above two talks as well. There was some more detail on the electroluminescent QD approach that showed how similar and different the approach is to OLED. He showed the results of work published by TCL on all three colors last March. External Quantum Efficiency (EQE) is now above 15% with these Cd-based materials, which is deemed to be market acceptable, but the blue lifetime remains a big challenge. There are a lot of degradation factors that still need to be worked out before EL-QDs can become commercially viable. Nanosys had their own booth but also pointed out 3-4 other products on the floor that featured quantum dots. 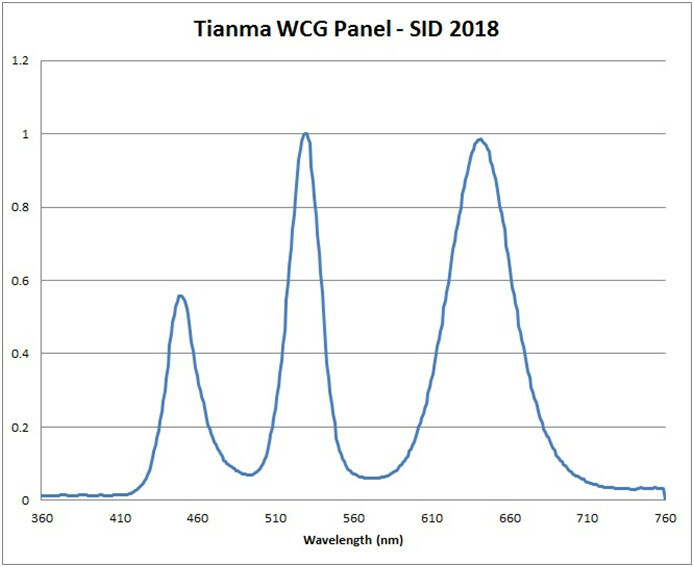 They could not say which products specifically had their materials, but a quick check of the spectral profile helped identify their quantum dot solutions. 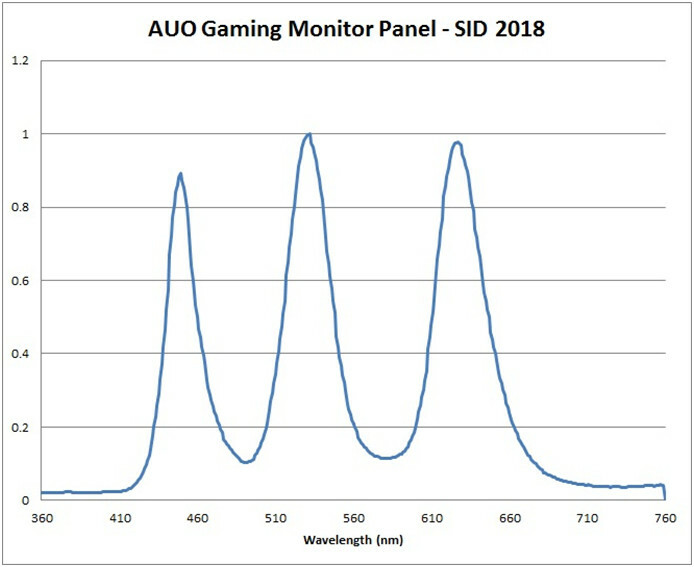 For example, AUO’s gaming monitor’s narrow spectral peaks for red and green looks a lot like the CdSe QD performance referenced by Dr. Charlie Hotz in his Monday Seminar. On the other hand, Tianma’s 31.5″ panel’s super-narrow green is a dead giveaway for Nanosys’ Hyperion materials. 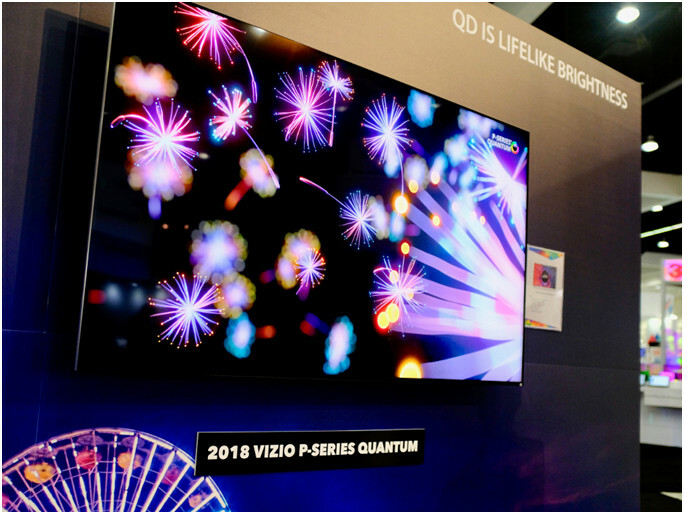 In their booth, Nanosys was highlighting the P series Vizio QD 4K TV looked extremely good. Be careful if you are looking at these TV as there is a P Quantum series and a regular P series (without quantum dots) and very different price points. On the second leg of the triangular booth, a comparison of a 2017 LG TV was next to a new Samsung TV. This clearly showed the value of the brighter luminance on the Samsung TV as the brighter colors appear to be more colorful. The third leg was focused on discussing the ink jet printing results where samples were available to look at (including fine pitch versions visible with the magnifier). They showed two samples developed in cooperation with DIC. One was a solvent-based solution that has lower viscosity and can create a thinner layer, albeit with multiple steps via thermal curing. The non-solvent approach creates a thicker layer with UV curing, but offers the advantage of a lower CAPEX. There were multiple session on quantum dots in the symposium session so this remains a very hot topic of interest in the display industry. It will be very interesting to see how all these various QD-based architectures get commercialized (or not commercialized). Is the Red Hydrogen One Phone the Start of Something Bigger?